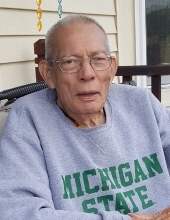 Celebrating the life of Allen Thomas Mike, Sr.
Obituary for Allen Thomas Mike, Sr.
Allen Thomas Mike, Sr., 83, of Lapeer formerly Kingston, died Tuesday April 2, 2019. He was born July 16, 1935 in Pontiac to parents Timothy and Pearl (Salisbury) Mike. Mr. Mike was a hard worker; from being a mechanical engineer to a professor at a college. He was an avid ham radio operator and had a passion for photography. Allen was a collector too; he had a brass collection, ink pens and old-fashioned shaving razors. He will be missed. Allen is survived by his children: Allen (Debra) Mike, Jr. of Mayville; Mary Somerville of Sterling Heights; Adam (Carmen) Mike of TN; Carla Mike of Lapeer; Holly (David Randlett) Mike-Randlett of Lapeer, grandchildren: Nathan; Charity; Nicola; Brandon; Chase; Caleb; Caden, six great-grandchildren, sisters: Helen Liss and Arlene O’Neil. He was preceded in death by a sister: Jenny as well as his parents. The family has entrusted Muir Brothers Funeral Home, Lapeer with cremation. They are scheduling a celebration of life in the near future. "Email Address" would like to share the life celebration of Allen Thomas Mike, Sr.. Click on the "link" to go to share a favorite memory or leave a condolence message for the family.